Image Sensations offers many great brands and styles of clothing, from polo shirts and tees, to jackets, hats, and aprons. Several polo shirts are now available in both ladies’ and men’s compatible styles and there are now more choices in ladies’ tees. Please feel free to browse our online catalogs below. Prices are not included in our clothing catalogs due to the fact that pricing varies, depending upon the quantity, sizes, and colors ordered, as well as the preferred decorating method. We offer both embroidery and silk screening. Once you see a style you like, contact us and we will review your decorating options with you and give you a quote. 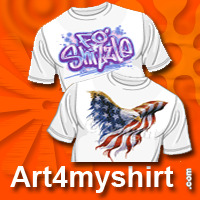 Image Sensations can make your shirt with one of hundreds of designs. Click here to view our design catalog and let us know which design you would like. ©2017 Image Sensations | (last updated 1-28-2017) | Designed and hosted by Park Lane Services.